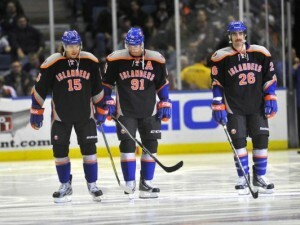 Last night, the NY Islanders played, for the first time, in the new third jerseys. It’s predominantly black with the team’s colours in the piping, the front of the jersey features arching text across the front with the players’ numbers right below. Sound familiar? It’s a bit of a rip-off. 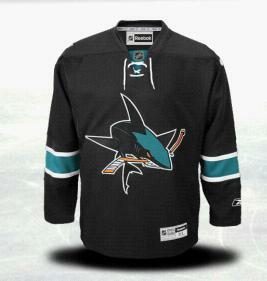 And there’s nothing really new or innovative about this jersey at all. 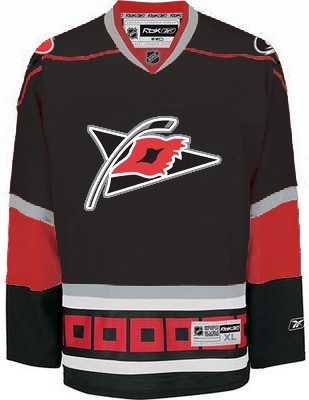 A dominant black jersey is, in generally, being moved away from in NHL jerseys these days after almost every team experimented with it. 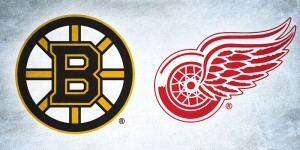 It’s also a clear break with traditional jersey design in the NHL and leaning more towards that of the rest of the major sports’ jerseys (MLB, NBA and NFL). That’s not necessarily a horrible thing, but I’m glad it’s just been relegated to the third jersey only to be worn once in a while. Hockey jerseys, with their prominent logos on the front, are a thing of beauty. Also, specifically to the Islanders, it seems strange for a team that has struggled for upwards of a decade on the ice, has trouble filling its building on most nights, and after having such a storied legacy as one of the most successful dynasties ever from the States, would eschew their logo (which is at least not in the 9 worst logos in the league, according to this site) and relegate it to a shoulder patch. But the detailing is something atrocious. Remember the last time a team featured prominent ‘V’ shapes all over their jersey as accents? Mmm hmm. I think I’ll give this one a pass. What are you thoughts? Throw it on the trash heap? Or hand it out in place of the Stanley Cup? I saw that Uni-watch totally panned it. I don’t think it’s the worst jersey in the world. But it’s certainly not the best. Especially when your identity involves the logo that has been pushed to the shoulders. I don’t think it’s as bad as the Gorton’s Fisherman uniform from the ’90s. It’s just kind of generic and bland. And I’m glad that I’m not an Islanders fan who has to deal with it. 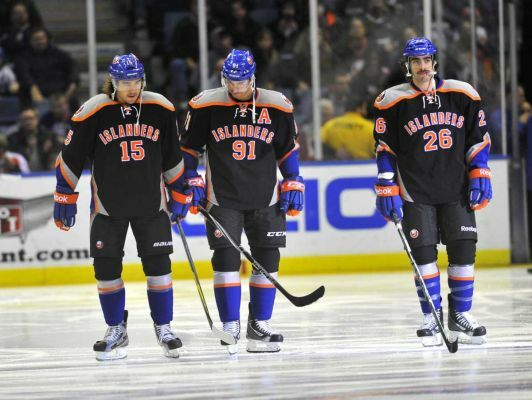 And the Isles are obviously late to the black uniform party. Totally agree. Those ’90s jerseys were truly awful. 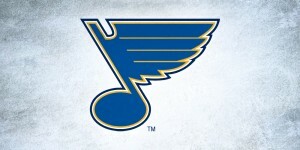 They got things right by going back to their original colors and bringing back those classy jerseys from their beginning. But then they introduce these awful things. 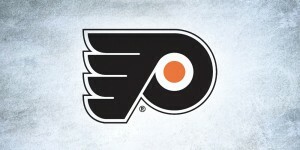 Remember they had those terrible orange third jerseys as well. I don’t know what the Islanders marketing department is thinking but they really need to stop.